The DoubleTree by Hilton hotel is an official Universal Partner Hotel and is located within walking distance to the various Universal Studios Theme Parks and Universal CityWalk™. It is also just a 10 minute drive to the Orlando Convention Center and 20 minutes to Orlando International Airport and Walt Disney World Resort®. 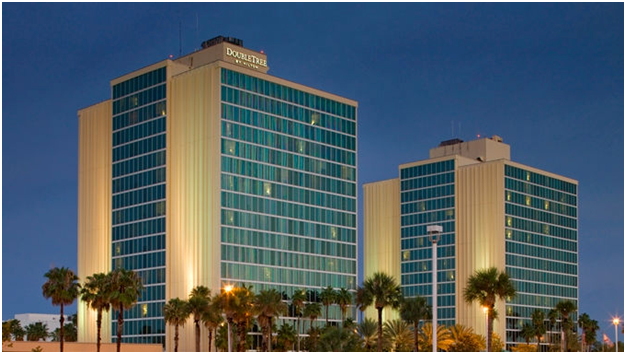 If you are attending the LEIU/IALEIA Annual Training Event in Orlando, FL April 29 – May 3, 2019, the Doubletree Hotel is now SOLD OUT! If you have already made reservations at the Doubletree and need to cancel them, please e-mail our Hotel Room Coordinator, Linda Muir, at lmuir@helmsbriscoe.com Please do not cancel your room directly. This will allow us to reallocate your room to someone who was not able to make reservations. If we do not use your room, we will cancel your reservations and you will not be charged. If you would like to be added to the wait list for rooms at the Doubletree, please email Linda. For those who have yet to make reservations, we have identified an OVERFLOW HOTEL that is only a 3 minute walk from the Doubletree. Rates will be honored 3 days before and after the event. TO MAKE RESERVATIONS at the Fairfield Inn & Suites, please click here. Note: We have implemented a new hotel reservation caveat that is linked to the overall event registration rate. Please see REGISTRATION & AGENDA for details.